It is good to be back on my blog after a short hiatus! I managed to make it through a busy school holiday period alive, as did my four children! Hooray! I have a review for you today of some products by the brand PHYSIOGEL. You may have noticed this brand appearing on the shelves of your local Priceline pharmacy over the last few months, and you may have initially glanced at it and then kept on walking. If you are like me, and suffer from very dry skin and frequent bouts of excema, especially in the cooler months, then you might want to turn around and walk back to that display and take a closer look! According to PHYSIOGEL, dry, sensitive skin has met its match! Hypoallergenic, fragrance, preservative and colour free, I have enjoyed these products to gently protect not only on my own skin, but my children's as well. If you have been reading my blog for any length of time, you will know that I am quite fragrance driven when it comes to beauty products, particularly bath and body washes and lotions. Whilst I find fragrance to be an important sensorial aspect of daily self care, I do find that during the winter months, my skin will improve quite dramatically with the introduction of products designed for more sensitive and reactive skins. You will see on the packaging of PHYSIOGEL a reference to a trademark term 'BioMimic Technology'. In my understanding, and from a little of my own research, this is due to the formulas containing ingredients that will promote and restore the natural barrier functions of the skin. Physiogel products contains lipids, which are a type of "good fat" that are already naturally present in our skin. Because they are already naturally occurring in our skin, Lipids are often described as physiologic moisturisers. These physiologic moisturisers are able to aide in repairing the skins natural barrier and calm inflammation. An example of a non-physiologic moisturiser would be petrolatum, or mineral oil. Whilst products containing petrolatum provide an effective barrier to moisture loss, they will simply sit on top of the skin, treating the symptoms, but not really improving the skins ability to protect and repair itself. Interesting isn't it?? I though so! Righto, enough rambling then Lou! Please do read on if you would like to hear my thoughts on these products! ( finally... ). PHYSIOGEL Daily Moisture Therapy Body Wash, Calming Relief Lotion and Cream. PHYSIOGEL Daily Moisture Body Wash RRP $9.99 AUD. The Daily Moisture Therapy range includes two creams and a lotion to nourish and repair dry and sensitive skin, along with a gentle, soap free body wash which is designed to cleanse, soften and hydrate. I have been trailing the body wash, and it's safe to say that my tube is officially empty. I had to pull some air into the tube in order to take a decent photograph! It has a beautiful, creamy, velvety texture that cleanses gently without stripping the skin of its natural oils. The formula contains good for skin ingredients, and includes Trygylcerides (fatty acids), Glycerin, and Shea Butter just to name a few. Typically, cooler weather will see me desperate to get some sort of moisturiser onto my skin straight after my shower, however when using this body wash, my skin always felt just comfortable and clean. My 8 year old son was also a keen supporter, always asking to use " the one in the blue tube please mum" in the shower! Like me, he suffers from dry, excema prone skin, and using this, in combination with the Calming Lotion has seen his skin improve immeasurably over the winter months. PHYSIOGEL Calming Relief Lotion 400ml RRP $28.99 AUD. Described as a lightweight, fast absorbing lotion to soothe dry, irritated skin, PHYSIOGEL Calming Relief Lotion does exactly that. Whilst it does not claim to moisturise your skin for some unlikely amount of hours, once I have applied this following my shower, I find my skin to be calmed, and feeling soft and moisturised all day. All day. My skin just looks healthier. Like the body wash, it contains Shea Butter, Glycerins, and those lovely lipids to lock in moisture. It does have a very subtle scent, what I would describe as a "pharmaceutical" scent ( hopefully that makes sense? ) however it disappears after a minute or so, and is then really not detectable. Again, I have used this with great success on all four of my children's skin, with noticeable results. This large 400ml bottle has lasted us a long time, and whilst a little more expensive than your typical supermarket or pharmacy body lotion, I would not hesitate to warmly recommend it if you too have dry, sensitive, or irritated skin. It's a good one, and worth the investment in my humble opinion. Physiogel Calming Relief Cream 100ml $12.49 AUD. PHYSIOGEL Calming Relief Cream is the thicker, more emollient sister to the Calming Relief Lotion. Also containing those lovely lipids, she has an added kick of nourishing Olive and vegetable oils to further protect and moisturise the skin. I have used this on particularly dry patches of skin, or areas of excema, and have enjoyed using it as an intensive, nightly hand and foot cream. It is thick, rich and protective. A fantastic product to have handy in the bathroom cabinet! 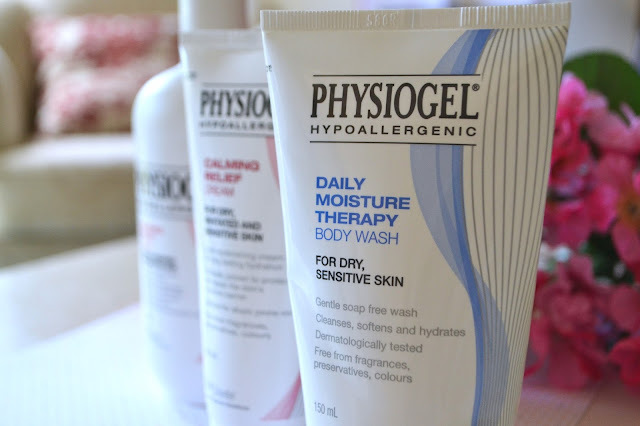 You can find out more about PHYSIOGEL on their Australian website here. For My International beauties, head here. 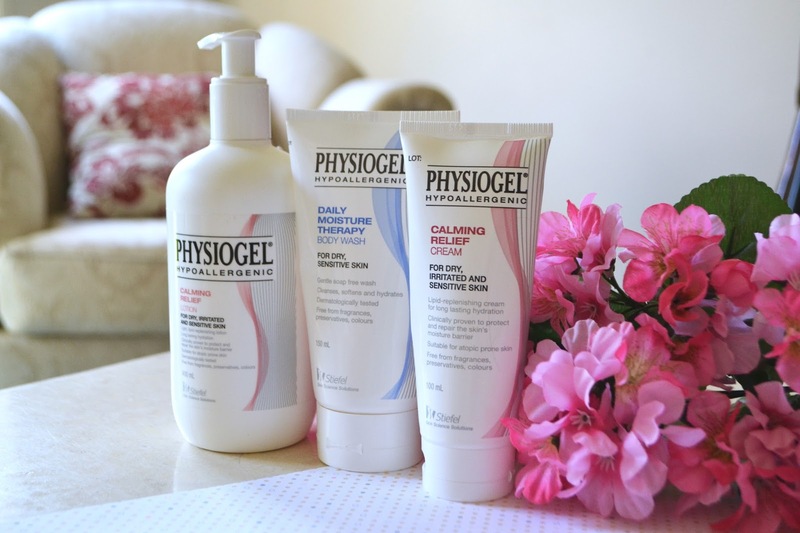 You can find PHYSIOGEL products at your local Priceline Pharmacy! 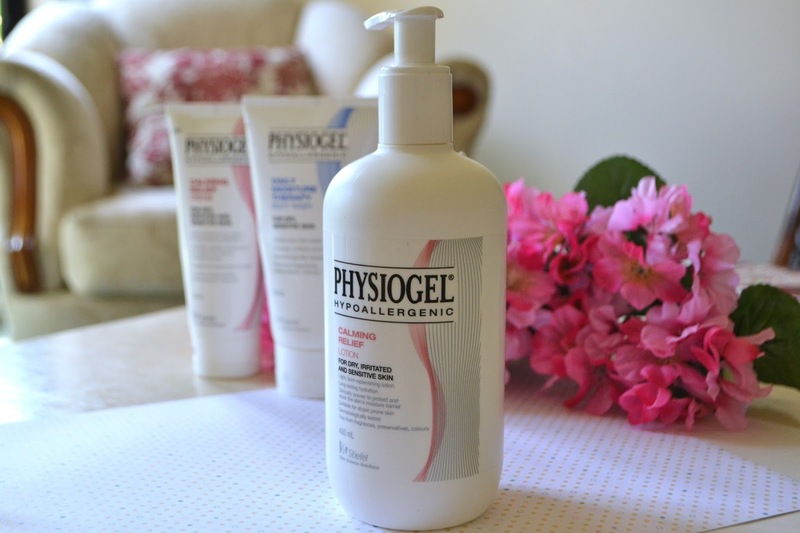 Have you tried any PHYSIOGEL products? Do you suffer from dry, sensitive skin? Please leave a comment or question below, or any products that you enjoy using on your dry skin!